I think I shared that when demo started on our kitchen, 3 days after I got out of the hospital after delivering Piper, I nearly had a mental breakdown. There were tears and moments of regret (over the kitchen remodel that is…not the baby!). The pounding was SO loud and there I was, on maternity leave with a 3-day old – sleep deprived, hormonal, and holed up in my master bedroom mid-panic attack, telling myself that six weeks would FLY by. And then I cried more that day. The pounding (to that extent) was very short-lived. THANK GOD. And when six weeks had come and gone and my kitchen was dreamy and complete, I never thought I’d end up missing our general contractor, Tim. Others in town had said he “becomes a part of the family”…but I never thought that would actually end up being the case. He was here every morning for weeks on end and he was here all day long, working until dinner time or even after. Tim was a constant in our house, especially since I was home so much of the time. On his birthday, I bought him his favorite beer because he refused to tell me his favorite dessert (…and probably because my kitchen was mid-remodel). 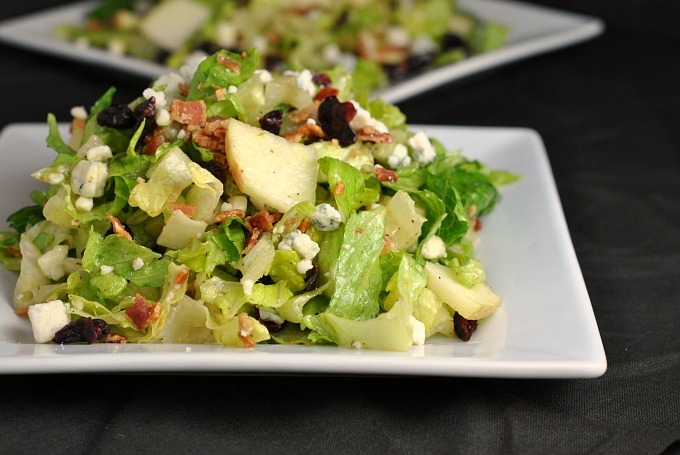 Other than Pepsi, I never saw the man eat or drink anything…until one day, he professed his love for a salad from Culver’s – the Cranberry Bacon Bleu Salad. It sounded delicious and so I ran with the idea – cranberries, bleu cheese, and of course, bacon. Since I’m obsessed with and now stock the dressing that went on the Warm Quinoa and Brussels Sprouts Salad, I used it in this recipe, too. Delicious! I’ve made this salad with various seasonal add-ins, such as pomegranate and pear. Mmmm! In a small bowl, whisk together the dressing ingredients until well-combined. 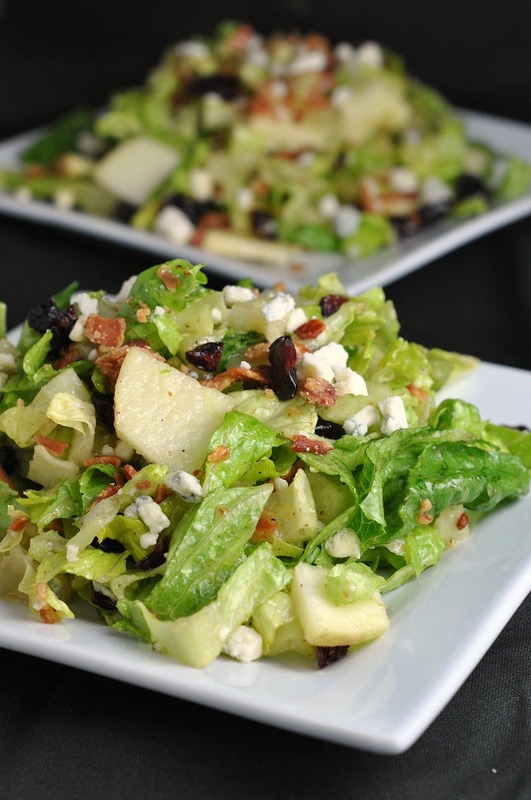 Place chopped lettuce in a large bowl and drizzle with dressing; toss well. Add remaining salad ingredients and toss again. Serve immediately. When I did my living room remodel last year, the contractor would always walk in and call for the dogs and would spend the first five minutes of the day petting the dogs – I took that as a good sign! 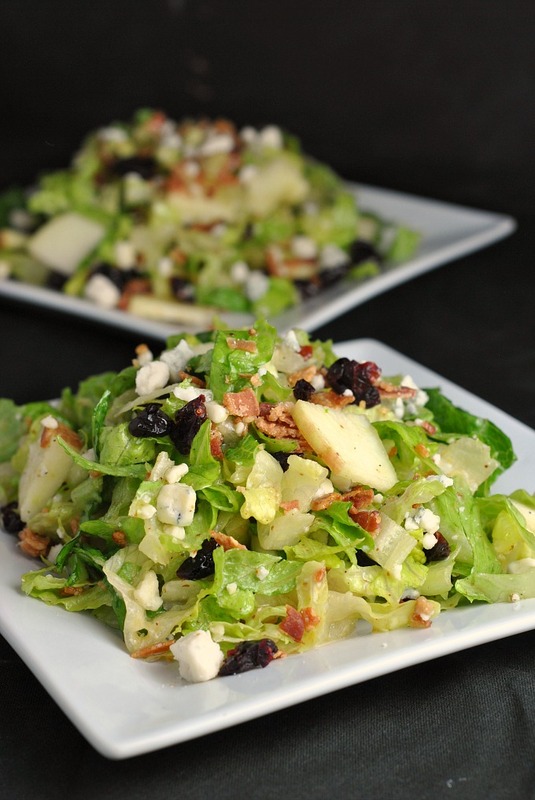 Excellent Cranberry Bacon bleu salads recipe!! I super love salads! Would love to try this recipe. 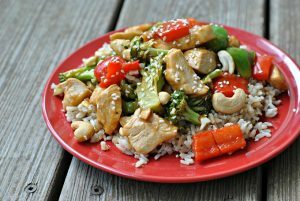 So easy to prepare and very healthy. Thanks for sharing this. 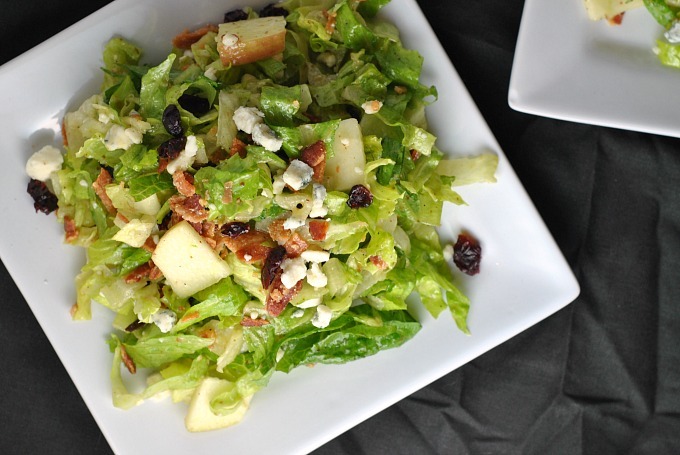 So healthy Cranberry Bacon bleu salads recipe you shared, I like your article, so healthy and tasty! Hi,I love salads! Would love to try this recipe. 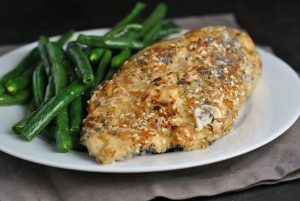 So easy to prepare and very healthy. Thanks for sharing. Thanks for your comment 🙂 Enjoy!